﻿ Diving Carriacou, the dive instructors and sites for scuba divers to explore. Diving Carriacou, the dive instructors and sites for scuba divers to explore. Dive at Sisters Rocks - Mabouya Island - Jackadan. What can you expect when diving around Carriacou. Description of best reefs and Carriacou's waterlife. Guides » Diving around Carriacou. Carriacou and Grenada dive sites and diving centres. Diving centres and dive sites on Carriacou. Not a diver? Try snorkling, it is nowhere better then here on the island of reefs. While planning a dive trip to Grenada you must include an excursion to Carriacou (which means “Land of Reefs”). Both islands have spectacular diving — suitable for everyone from beginners to experienced divers. These are the diving locations, the listings from above will open in here. Underwater life on the reefs. Wreckdive on Carriacou – the Westsider at Mabouya Island. The Rose is a wreck in Tyrell Bay. The Boris lies at 28 metres near Mabouya Island on Carriacou. 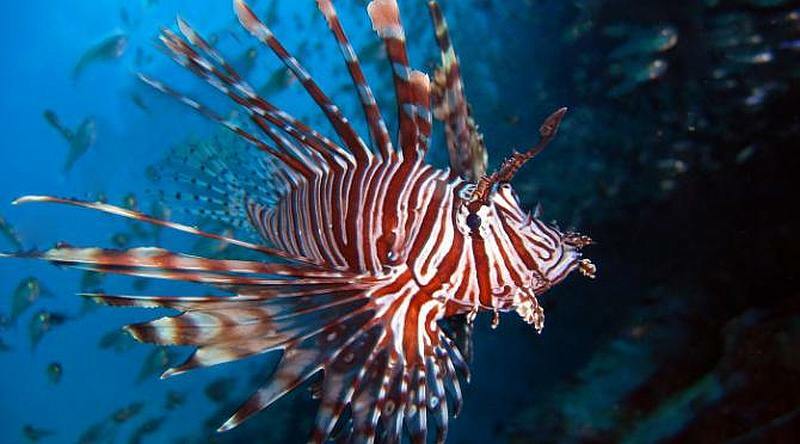 Lionfish are an undesired species. Depth of the Dive site: 15 m/ 72 ft. Easily described as a calm bay with a sandy bottom, the Anse la Roche reef is surrounded by parrotfish, spotted drums and spiny lobster. Sometimes you can even see large rays relaxing on the bottom. Within the Anse La Roche region, you will find Triggerfish Alley and Arc Du Vero. Both easy and relaxing dives. Anse La Roche is highly recommended for snorkelers and beginner divers. Located at the picturesque Anse la Roche Bay, this reef dive begins in a lovely coral garden. The site is dotted with boulders and clumps of coral, creating the perfect hideout for octopuses, crabs and small morays. Dive at Sisters Rocks – Mabouya Island – Jackadan. 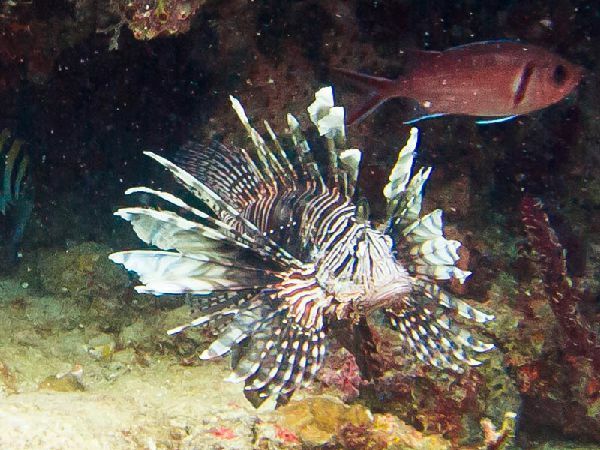 What can you expect when diving around Carriacou? Description of best reefs and Carriacou’s waterlife. Wrecks and sharks, lots of underwater exitement. See some videos of the best dive locations around Grenada and Carriacou. Sisters Rocks dive – Carriacou. Ronde, so don’t get confused. Depth can be to 100 feet (30 m), with spectacular walls, large rocks and many barracudas cruising about. 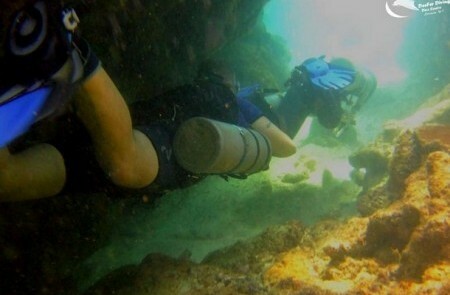 This is a good dive site for your wide-angle lens. The Westsider wreck at Mabouya. The 30 metre long wreck of the Westsider near Mabouya was officially sunk on September 4th 2004. This wreck is in excellent condition. 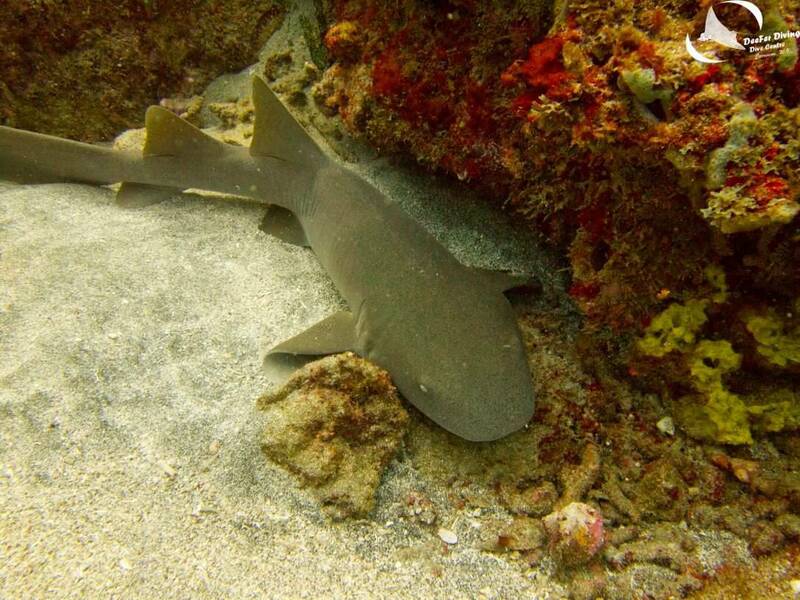 See nurse sharks and lobster, queen angelfish, french angelfish, barracudas, critters and more than average coral growth one expects in such a short time. The Westsider at Mabouya Island. The Boris at Mabouya Island. Depth of Dive site: 28 m/92 ft to keel, superstructure at 16m/52 ft.
Adorned with corals and home to a great deal of snappers and French angelfish, this long tugboat was sunk in September of 2007. Safe for exploring by qualified divers, you can sometimes find a nurse shark or barracuda in the captain room while creole wrasses, jacks, and grey angels swirl all around. Even more interesting is that the Boris Wreck is located only 100m away from another great wreck called West Sider. Mabouya Island dive – Carriacou. The wall starts at about 35 feet (11 m) and slopes to 70 feet (21 m). Lots of purple vase sponges and dramatic backdrops. If you are a macro photographer, this is a wonderful place to get all kinds of shots. Length of Dive Wreck 12 metres/ 40 feet. Depth of Dive site: 20 metres/ 70 feet. An artificial wreck, the Rose sits neatly on a sand bed. Giant lobsters are normally found inside the hold while green moray eels hide in the mast. Surrounding the wreck are lots of stingray, porcupine fish and more. The sand around it however, plays host to numerous stingrays, garden eels, urchins, and more. Take a bearing on the shore before jumping in the blue and have a ride to it after visiting the wreck. Jack A Dan dive – Carriacou. A shallow reef that makes an excellent dive training site or reef for beginners. The top of the reef is at 20 feet (6 m) and is almost always calm. Lots of sea fans and a variety of hard corals. Advanced divers will find a lot of high-voltage diving opportunities. Most diving is conducted from boats and drift diving is standard fare throughout the Windwards. Diving operators on Carriacou – Dive schools. Dive shops and Dive Excursions. Deefer diving dive operator in Hillsborough. Deefer diving is a PADI 5 star dive center. The shop is located north of the main street in Hillsborough. See the Carriacou diving map above for the exact location. Padi courses and Padi divemaster courses. Dive and stay package deals. Diveshops in Tyrell Bay – Harveyvale. Arawak divers have been operating their diveshop and tutorals for many years on Carriacou. Located on the street along the bay in Harveyvale, see the diving map for the location of Arawak Divers. Rental of Kayaks, small canoes for rent in Harveyvale. These are great to explore the mangroves and oyster beds of Tyrell Bay. Lumbadive is operating from the south end of Tyrell Bay, right below Pizzeria the Lazy Turtle. There is a lot of information about the diving on the Lumbadive website. Diveguide for Carriacou and the Grenadines. Marine life around Carriacou, some pictures and a description. Video Gallery of diving around Carriacou. Dive operators typically use guides with surface marker buoys to lead groups. Because of the strong currents sometimes involved, I’d recommend carrying an inflatable surface tube, a Dive Alert® audible signaling device or whistle, small signal strobe and reflector in your buoyancy compensator (BC) pocket for safety — just in case you get temporarily separated from your guide. Grenada does not have a recompression chamber. Trinidad and Barbados both have recompression facilities, about 30 minutes away by air ambulance. All members of the Grenada Scuba Diving Association have an emergency plan and oxygen on board their dive boats. Carriacou and Grenada are getting more and more visitors every year. 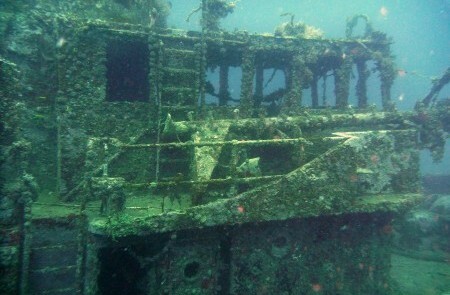 However, since Grenada and Carriacou are charmingly off the beaten track, the reefs, wrecks and corals remain unspoiled. Grenada’s dedication to preserving its marine resources is evident. 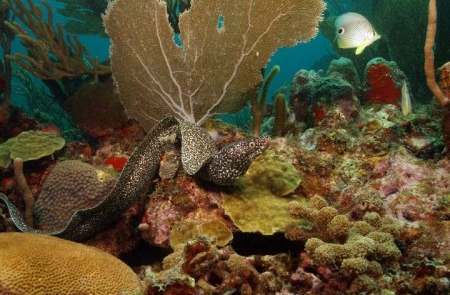 A large portion of the island’s offshore real estate has been designated as an underwater marine park that features moorings installed at popular dive sites. A park ranger patrols the area by boat. The area is a no-take zone and divers are reminded not to disturb coral or marine life within park waters. Overall there is a larger variety of fish life in the Windwards than in other upper Caribbean destinations. It would be impossible to visit every dive site while on a weeklong vacation, but here is a list of some of the best sites. Great dive sites on Grenada. Boss Reef dive – Grenada. This is an extensive reef that reaches from the red buoy outside the harbor entrance towards Point Saline. There is a vast expanse of soft brown coral trees which form an “other-worldly” landscape. There are large shoals of tropical fish, often including clouds of blue creole wrasse. Lobsters can often be seen peeking from crevices. 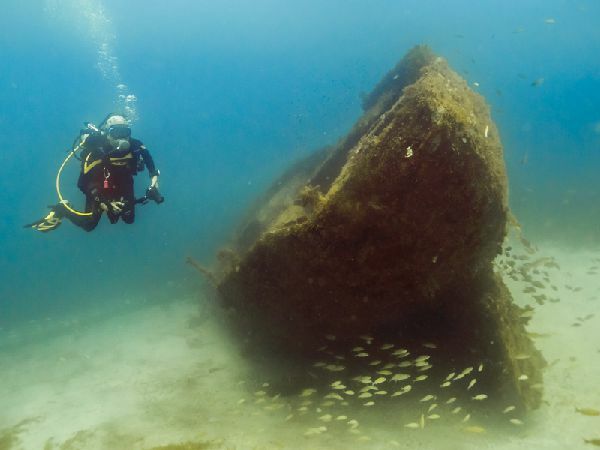 Twin wrecks dive – Grenada. On this dive you will see the wrecks of the Veronica and the Jeannie S, which are just to the northwest of St. George’s Harbor entrance. The Veronica is a small, barge-like cargo vessel lying upright on the bottom in about 45 feet (14 m) of water. There is a crane on board with its derrick extending outwards, covered with colorful marine growth. The hold is open and you can swim around inside. The Jeannie S is a cargo vessel about 120 feet (36 m) in length, which sank recently and is still quite intact. You can see the radar console and instruments in the wheelhouse, and the radar scanner still turns freely. 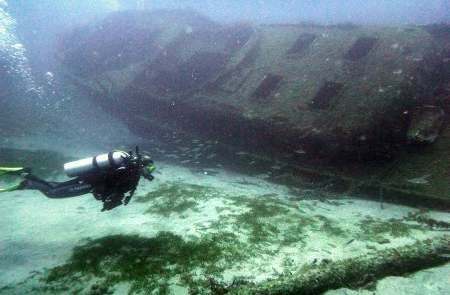 The wreck lies on its port side in about 50 feet (15 m) of water. You can swim around in the hold but some care is required, as the contents of the hold may not have fully settled. The two wrecks are within a five-minute swim of each other. Molinere Reef dive – Grenada. Molinere Reef is part of Grenada’s underwater marine park, which extends to Flamingo Bay and offers excellent diving for beginners and the more-experienced. 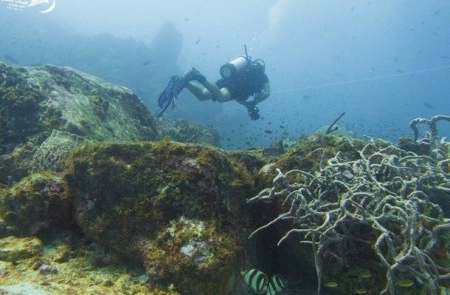 The dive starts at 20 feet (6 m), and the reef leads to a wall that slopes down from 35 to 70 feet (11 to 21 m). Around the top of the reef there is a variety of tropical fish including yellow-headed and mottled jaw fish and spotted drums. A short distance away from the wall is the wreck of the Buccaneer, a steel schooner lying on its side in about 70 feet (21 m) of water. 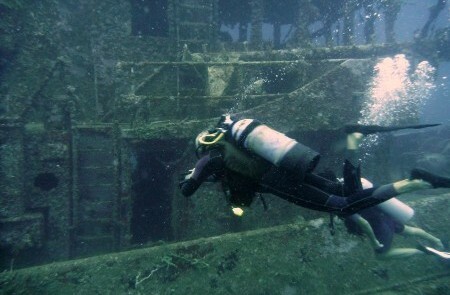 Bianca C Wreck dive – Grenada. Grenada’s most famous and spectacular dive. After catching fire in St. George’s harbor in 1961, she was towed out to sea by a British warship. During towing, she sank close to Whibbles Reef. The ship is encrusted with hydroids as well as black, hard and soft corals. There are schools of jacks and barracuda, and spotted eagle rays can sometimes be seen. The Bianca C is 600 feet (182 m) in length and lies in about 160 feet (48 m) of water, with its highest point at about 90 feet (27 m). The normal dive profile on the Bianca C is from 90 to 130 feet (27 to 39 m). This is an awe-inspiring dive, but due to the depth and the possibility of strong currents, it is only suitable for confident divers, and a checkout dive will normally be required. This dive is generally the shallow leg of a multilevel dive from the Bianca C.
Depths range from 60 to 100 feet (18 to 30 m). It is a drift dive for the advanced diver accustomed to dealing with strong current. The water carries you swiftly along the reef, with small sand sharks, barracuda and larger grouper browsing among the coral heads. Just off Glover Island, this is a reef abundant with all types of fishes and rays. On almost every trip, southern stingrays and juvenile nurse sharks are seen. A fun dive at 40 feet (12 m) with lots to see including a giraffe-shaped pillar coral. Previous: Dumfries Historical site and ruins. Next: World of dreams dive spot at Mabouya island.